Loving husband of Sheila. Devoted father of Lee and Brett. Loving Grandad of Ruby and Conall. 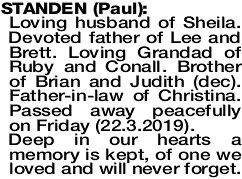 Brother of Brian and Judith (dec). Father-in-law of Christina. Passed away peacefully on Friday (22.3.2019).